What have you been dreaming of? Let’s make your project a reality! We will design, permit, and build your new addition, kitchen, deck, bathroom or basement. Licensed and Insured with 30 years experience. We don’t just build Home Improvement projects. We build dreams. Trust. It’s a pretty strong word. Many businesses would not use trust as a selling point, at least not in the headline on their home page. At Moniz Home Improvement, Inc., it’s our primary selling point. We work hard every day to prove Moniz Home Improvement is a general contractor you can trust. That starts with the work and being good at what we do. Our online portfolio offers representative samples of the quality of our work and the range of and size of projects we take on. Those include additions, bathroom remodels, kitchen remodels, decks, basement remodeling, window and door replacement, siding; you name it. Another key to building your trust: we ARE a Cape Cod contractor owned and operated by Cape Cod people. Ken Moniz was born, raised and lived his entire life on Cape Cod. That includes owning an area restaurant prior to starting Moniz Home Improvement. Cape Cod is our home, too. The same goes for most, if not all, of the trusted subcontractors who work with us. As Cape Cod residents and homeowners as well as construction professionals, we know what a Cape Cod home must endure in terms of weather. Winds can gust up to 100 miles per hour. Hurricanes and nor’easters pound your home’s exterior with snow, sleet and rain. Also, the sun seems to burn brighter and a little hotter on the Cape. And the humidity? Owning a Cape Cod home means running a dehumidifier or another kind of system to control humidity in your basement. In terms of the upkeep of your home, native Cape Cod contractors seem to have a better feel when it’s time to start thinking of replacing a roof, deck, shingles or other improvements. The life expectancy of a product may say one thing. A Cape Cod contractor worth his or her salt, pardon the pun, knows otherwise when repairs or replacement are needed. As Cape Cod contractors, Moniz Home Improvement has worked with most, if not all the municipalities on the Cape. When your project needs a permit, we know where to go and who to see to make that happen so your home improvement project stays on schedule. And if your home improvement project is part of an insurance claim, we will help you with the paperwork to expedite the process. That might not be something other Cape Cod contractors would do. Ken Moniz didn’t start Moniz Home Improvement to be like other contractors. In addition to a love of building and fine craftsmanship, we love working with our customers. We view every project as a collaboration and as the start of a relationship. In some cases, friendships. Those relationships start with an initial assessment of your home and the area you’re considering. Then we sit down and start what becomes a brainstorming session. That includes discussion about the project, budget, time frame, etc. If you’re a seasonal or part-time resident, we can include the logistics of how we will work together in that discussion as well. 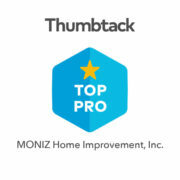 Moniz Home Improvement is fully licensed and insured and the initial estimate is free. We are happy to provide references if you want to get a sense of how we work. You’ve heard it said a million times that your home is probably the biggest investment you will ever make. Well, some of the home improvement projects we undertake are a close second or third. Moniz Home Improvement doesn’t take that lightly. With each project, we know we have more to do than the actual work. We must build a relationship and earn your trust. That’s a challenge this Cape Cod contractor gladly accepts.